So, I purchased my first Project Life (PL) digital core kit back in the last spring having no idea how these things worked. I thought maybe you just print off the cards you want/need them and go from there. Turns out there is this whole world of digital scrapbooking. #duh I mean, I think I knew that, but I had no idea how to go about it. Well, fast forward to this week. 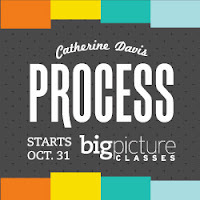 I am enrolled in a fabulous class put on by Big Picture Classes called "Process with Catherine Davis". I don't think I had any idea of what to expect with this class, but I have already learned so many techniques and tips. The class has also inspired me to actually start learning and using Photoshop. I edit 99% with Lightroom 5 (LR5) but have a subscription to Photoshop CC (PS). I do have a few Photoshop actions, but really feel most comfortable editing in LR5. It's useful for designing Facebook and Etsy ads. So, here is my first all digital Project Life layout. I cheated and pretended that I do weekly spread, when in actuality my 2013 PL album is a hot mess of thousands of pictures in chronological order. I liked having to choose a select few photos for a spread instead of all. of. the. pictures! I used the Digital Project Life: Kraft Edition for this spread and lots of brushes that I had apparently been collecting in PS. Arrows, month stamps, day of the week brushes, cute little camera. Who knew that was all there waiting for me in Photoshop? I can see this being a really fun way to "scrapbook" when I can't have all of my physical supplies with me, like over Thanksgiving weekend up at the Lake. Do you do digital scrapbooking? Which do you prefer: digital or paper? Let me know in the comments below. Or better yet, link to your favorite personal layouts. This looks awesome! 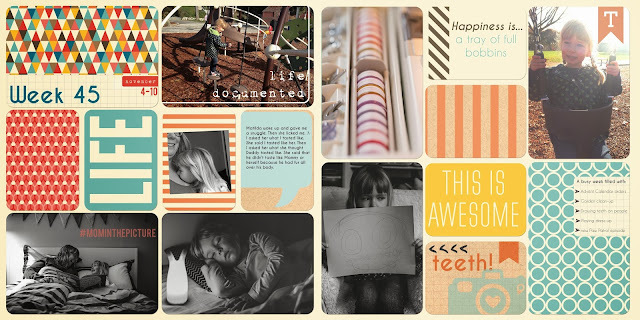 I love the idea of digital scrapbooking. I don't have the space in our tiny house to do any real scrapbooking, but this seems totally doable! This is so cool! I need to do some digital scrapbooking! I would love to digital scrapbook but I am sooooo not creative. I need someone to create the whole page layout of me so all I have to do is add the photos. Your pages are adorable! Ok, you've definitely inspired me to check this out! What an awesome way to preserve memories! This is really cool - I know nothing about digital scrapbook, but looks like an awesome way to collect and organize and present images from throughout the year - your spread looks awesome!